When getting into blacksmithing one of the things that attracts a lot of people is being able to make their own tools. However one of the realities is when you're starting off, you don't have good tools with which to make better tools. This guide is all about the must-have blacksmith tools for beginners. A simple and inexpensive beginners kit I recommend is available on Amazon. It has all you need other than a forge and anvil. Often, simply buying a tool to start with is a great idea it, can save you a lot of time and frustration that comes with working with a tool not designed for the job you are using it for. That being said, what I'm going to do below is go over the very basic tools that you need if you want to get started in blacksmithing. I'm going to point out the things you can use that you might just have laying about or will be easy to put together as well as some of the less expensive paid options that you can find online where the right tool for the job can save you a lot of that time and frustration. I definitely do not recommend just buying everything right out of the box, you can get a lot done for very cheap and that's how I got started personally. I had a lot of stuff from working as an electrician plenty of tools such as pliers, and hammers and things like that worked well enough for trying it out, to see if I really enjoyed the act of blacksmithing as much as the idea of blacksmithing. Turns out I love actually working on the anvil. My first anvil was a foot-and-a-half long section of railroad track that I stood on its end and mounted to a stump. I used an angle grinder to turn one of the sides into a makeshift hardy chisel for cutting stock. When my wife bought me an anvil for one of our anniversaries (a used one) the railroad track quickly got replaced and the difference was night and day. However there were a lot of things that I learned while using that piece of railroad track that came in very handy when I started using a real anvil and there are a lot of projects I couldn't have done if I just waited to get the ‘proper’ tool you should have rather than just making do with what I had. Anvils are expensive and heavy, so they cost a lot if delivered, finding a used one or making something like a railroad track post anvil is a great way to get on with moving metal rather than just dreaming about it. The way my wife found mine was a $5 classified ad in a local buy-and-sell paper. Lots of old men still read the buy and sell papers front to back and will jump at a chance to get rid of that super heavy paperweight in the yard. I got a 200+ lb peter wright in pretty good shape for $100. For comparison on eBay, they range from $500 to $2500 PLUS DELIVERY! Other than the Anvil the most iconic pieces of blacksmithing kit that you'll need might be the hammer and forge. When you start out you really only need a few hammers for forging texturing drawing things out and the rest of things that you be doing at the Anvil. You want to look for Hammer that's in the 1-1/2 to 3 lb range. It's very important that you have a hammer that is heavy enough, to begin with. If you use a hammer that's too light you can actually develop a pain in your elbow and the top of your forearm right where the elbow bends. If it feels like a sharp, pinching sensation it's likely what is known as Carpenters Elbow. What happens with a hammer that's too light is you'll tend to push down on your arm in order to create the force needed to move the hot metal instead of allowing the weight of the hammer and gravity to do the work for you. Over time this pushing creates the injury described above. If you have a hammer that's too heavy you can get pain and discomfort in the shoulders and the wrist as well as the elbow, but that's usually just your body gaining strength to be able to cope with the weight of the hammer and that is something that will go away and will be very different from the sharp feeling of Carpenters elbow. There are four basic types of hammers that you'll be using you don't need all of them when you're beginning you really only need one. Typical cross peen hammers weigh between 1 and 4 lbs one of the faces is basically a big flat Square the other end Is the actual cross peen which looks like a pointed end and if you were to hold the hammer in your hand and look at it would look like a straight line running left to right. This is the iconic shape that is commonly known as a blacksmith's hammer for good reason and is the best choice for a first hammer if you are thinking of buying. The square side of the hammer should be fairly obvious in its use, it makes the metal flatter and moves it around in ways you can probably imagine. The other end, or cross peen, is designed to focus your force into a smaller area and allow you to draw out and move the metal much quicker because you're putting more force in a smaller area. 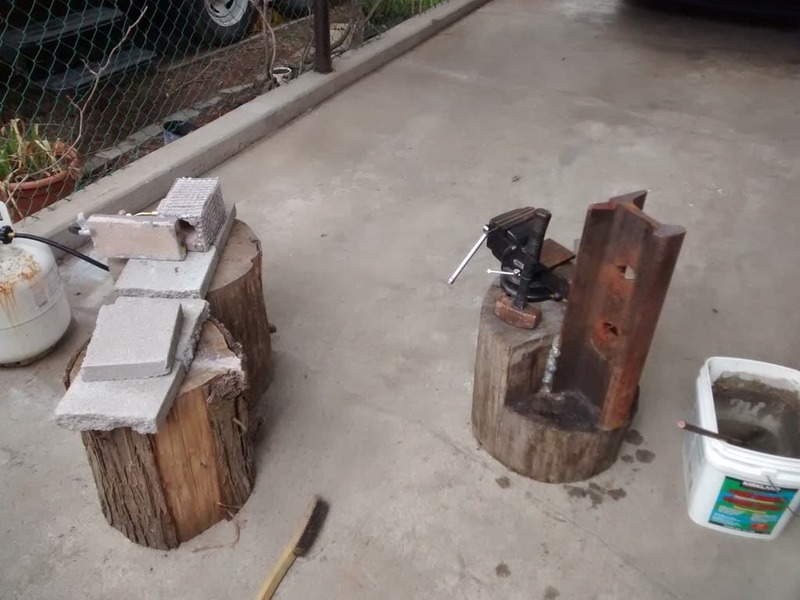 Moving metal faster while you're forging is important when you're working from heat to heat on your forge. This is the cousin to the Cross-peen hammer and is basically identical in every way except that if you hold the hammer in your hand the peen runs in line with the handle instead of across the handle. This Hammer is less common but also it has its uses in certain situations. Most people are at least familiar with what a ball-peen hammer looks like. Typically they have a smaller head on them and weight a bit less, usually in 1/4 pound to 2 1/2 pound range. It is named a ball-peen because one of the faces looks like half of a ball has been attached to the Hammer. the ball peen is usually used to add texture to pieces giving it that hammered look. Sledge Hammers are the heavy ones, usually weighing between 5 and 10 lbs. Normally they have two flat faces, no peen but some come different faces. Often they are slightly less hard than peening hammers and are usually designed for striking cold metal. Forges have one job, make your metal hot. They come in a lot of different styles From simple homemade DIY charcoal pits made with a few firebricks and a hair dryer all the way up to complicated and very expensive multi-burner gas forges. I’ll link to a video of how to make a simple coffee can forge which is a great way to start. What I personally use now is the Whitlox Wood-Fired Forge. I use this simply because I have easy access to lots of wood and charcoal and it's an easy, relatively inexpensive, but very useful little forge. Anyway, here is how to make a simple coffee can forge to get started smithing today. Tongs are the only safe way to move and hold onto hot metal. They take some time and practice to get used to using them, but eventually they will just be an extension of your own hand. While you can get by with using pliers, channel locks or vice grips those sorts of home tools aren’t really cut out for day to day work at the forge. If you're just getting started and don't have tongs and don't want to use pliers, one of the easiest things to do is just to keep your stock really long So the end not in the fire stays cool enough to handle. Tongs are definitely one of the things I would highly recommend that you actually spend a bit of money on to buy a proper pair of blacksmithing tongs. A good pair of wolf jaw tongs that are sized for the kinds of material you plan on handling will go a long way towards making your blacksmith projects more tolerable to pull off. Having bad tongs and not being able to hold your material securely while you're working is going to just lead you to frustration and slow down your learning process. There are plenty of how to guides showing how to make tongs yourself that you can find all over YouTube, I’ll link to one below, they almost always require that you actually own a pair of tongs to be able to make more tongs which is kind of self-defeating. Making tongs is not the easiest project to do when you are still figuring out hammer control and how to move metal efficiently and where you want it to go. However it is a great project once you have advanced to the point where it you need more tongs and your first set of proper tongs (while almost guaranteed to be ugly) will be something you will remember. Essentially chisels are just a way for you to break down large pieces of stock material into smaller pieces that you can handle easily. There are two kinds of chisels that you're going to need a hot cut, and cold cut. The names of which should be fairly self-explanatory. Hot cut chisels to use cutting hot metal, cold cut chisels to cut cold metal. You don't want to mix your chisels because cutting hot metal on a cold cut chisel will change the structure of the metal and soften the end making it nearly useless for cutting cold metals later unless you re-harden the tip. Sets of chisels are very inexpensive and also very easily made once you forging regularly. Now there are hundreds of other tools that you can talk about but for beginner blacksmiths, most of them aren't necessary. You will be able to create and or acquire them as you gain skill and find a need to have them. Tools like Fullers, swage blocks, guillotines, or hardy bending forks (which is actually one of the projects you should tackle fairly early on in my opinion because it's just very useful). Other hardy tools like having a hardy hot cut and cold cut chisel, cutting plates, punches, cupping tools, and drifts these are all things that you can buy but you likely don't need them right away. If I had to make one MUST buy item recommendation beyond wolf jaw tongs or the beginners kit (See My Guide To Beginners Blacksmith Kits Here) it would be The Backyard Blacksmith by Lorelei Sims. ​It is filled with tips and guides on how to get started and even projects to tackle in order to build your skills. EASILY worth far more than the couple of bucks to order the book so you can have it next to you at the anvil. All in all what you need to start is pretty simple... a thing to make the metal hot, something to hold onto the hot metal, a heavy hard thing to put the hot metal on, and something to hit the hot metal.